At first glance, when I noticed the photo of André Harvey’s bronze crow sculpture, Sounding the Alarm, in the article “The Caretaker of No. 13” in the Winter 2008 issue of Virginia Magazine, I was very pleased. But, upon reading, I realized that the writer did not know that the bronze sculpture was created by a UVA graduate nor that it is bronze. André Harvey (Col ’63), a fellow of the National Sculpture Society, has been a professional sculptor for more than 37 years. His work is in private and public collections throughout this country and abroad. The sculpture was a donation to the University by Blaine Phillips (Col ’52, Law ’55) of the Fair Play Foundation. 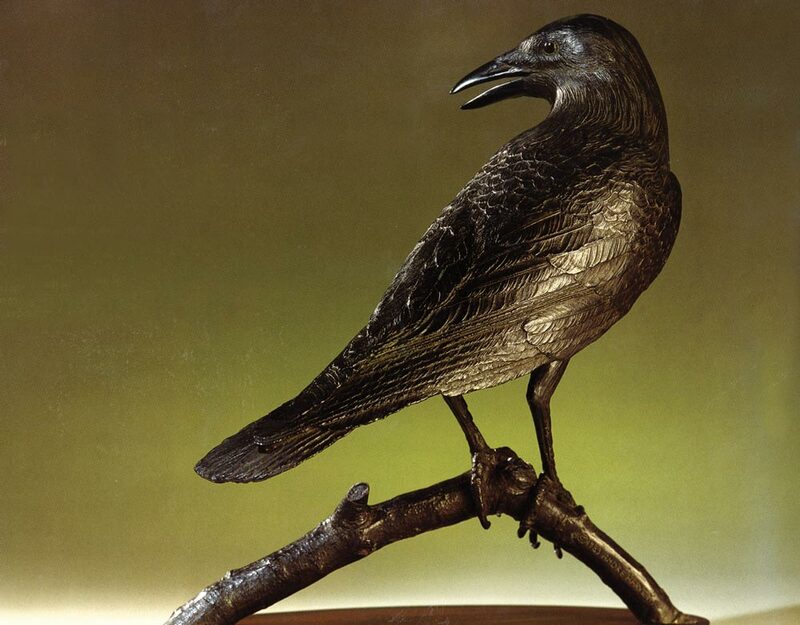 One wonders how this writer could have mistakenly thought this beautiful bronze sculpture could possibly have been a stuffed raven. The Wahoo Nation can take pride in its role assisting the University of Florida in its recent conquest of the BCS football championship. On the day of the game, the Miami Herald reported that the gator became Florida’s mascot exactly 100 years ago. Gainesville native Austin Miller, who was attending law school at the University of Virginia, was paid a visit by his father, Philip, who owned a store in Gainesville and wanted to sell banners and shirts for his local college. Austin came up with the idea of using an alligator as a mascot because the state of Florida is home to so many of the reptiles and no other college team was using that animal. A live alligator in a cage started traveling with the team in 1957, and it was transported (very carefully) all over the Southeastern Conference. Obviously, great ideas with meaningful impact on faraway places often emanate from Mr. Jefferson’s Academical Village. I thought that this would be of interest to all alumni, but especially to the large number that live in Florida. In the fall of 1957, I was hurrying across Grounds after having parked my car behind the Physics Building. It was perhaps near 7 a.m. and a bit chilly. The purpose of my walk was to visit my wife and my new daughter at University Hospital before returning to my first class that day. Within sight of the hospital, I noted a man walking toward me, and as we approached I wished him a good morning. He stopped and returned the greeting and asked my name. I told him and he replied in kind. I was surprised, and then embarrassed, at not having recognized William Faulkner. He didn’t seem to mind. He asked where I was going in such a hurry so early in the day, and I told him. He asked more questions about where I was from and about my family. I don’t recall that he ever said much about himself, but he listened attentively. After a brief period, he said that he had delayed me long enough and that I should hurry on so as to have ample time with my visit at the hospital. He resumed his walk, and I hurried along. In recent writings in the Virginia Magazine and letters to the editor, the tone regarding Faulkner’s interest and attitude seems very foreign to that which I experienced on that fateful morning. While I don’t recall the verbatim content of that brief discussion (some Faulkner admirers to whom I in later years related this event seem to think me strange for not recalling every word), I did find him to be interested in what I had to say, and his initial greeting and departing salutation were quite warm and genuine. After reading others’ thoughts concerning him, I have wondered what brought him to respond to my greeting and to stop and ask about me. Perhaps it was the apparent joy in a greeting at such an early hour, perhaps it was his curiosity at someone hurrying along taking the time to wish him a good morning, or perhaps it was the Alabama accent that caught his attention. Whatever the reason, it is a fond memory of my first encounter with an individual of public renown and a warm and friendly exchange. In the Winter 2008 issue, the drinking habits of UVA students were analyzed and discussed (“The Power of Normal”). It was reported that 38 percent of UVA first-year students typically don’t drink. The flip side is that 62 percent of first-year students do drink. The age of first-year students typically is under 21. With the legal age for drinking in Virginia being 21, it means that 62 percent of UVA first-year students are drinking illegally. Further, it means that persons (most likely students) of legal drinking age are illegally buying or otherwise obtaining the spirits for these youngsters. 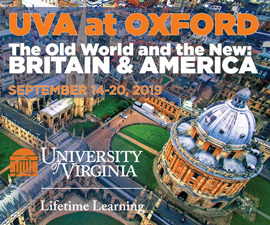 In the late 1940s, an economics professor commented that students at other institutions of higher learning generally considered UVA the “Country Club of the South” for its drinking reputation. Viewing this article on drinking as a whole, it appears nothing much has changed except that in addition to Virginia Gentlemen, we now have Virginia Ladies. Congrats on a wonderful edition of Virginia Magazine. I am a Darden grad and started a second career in youth substance abuse prevention after many years in the corporate world. Your article on social norming was encouraging, and I’m so glad UVA is addressing the issue. It will take many years to change the culture, one step at a time. 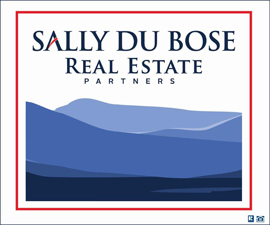 We primarily work with middle school and high school students and their families, hoping to delay onset of risky behavior and improve students’ ability to make good choices once they are more mature. If you are interested in our work, our Web site is speakuplflb.com. One is cheered to read (in “Deep Rooted”) about the ever-expanding University’s regard for vegetation. But what was the reason for the authorized mass arboricide in the 1990s of sweet gums in the Old Dorms area, healthy trees that had sheltered and soothed generations of undergraduates? 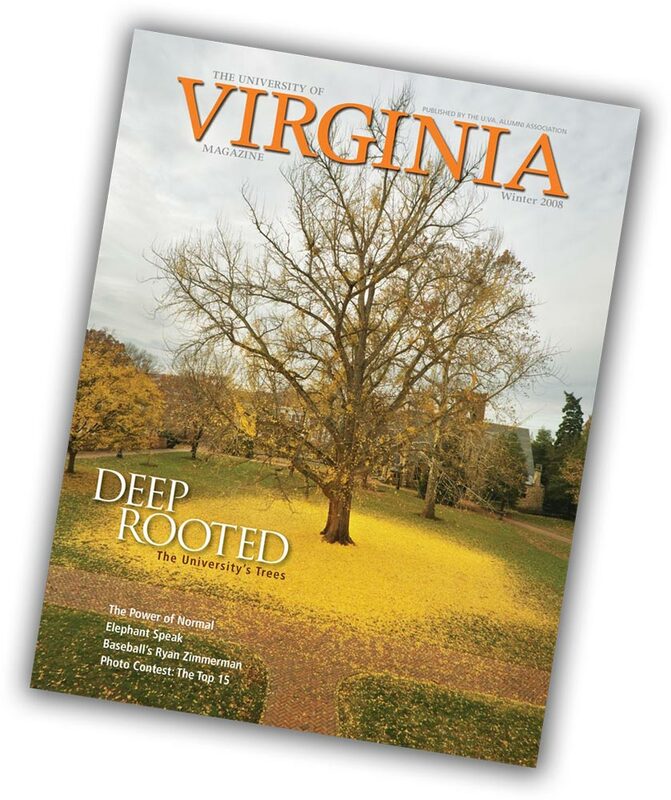 We contacted Jerry Brown, an arborist at UVA, about the sweet gum trees. His response follows.—Ed. I remember climbing in those sweet gum trees. Every year, landscapers would rake the fruit up by the truckloads. Sweet gum (Liquidambars styraciflua) can be a maintenance problem—fruit germinating in shrubs and ground cover beds, fruit on hard surfaces like steps and sidewalks where people could slip and fall. My guess for the removal of McCormick Dorm trees is the above maintenance concerns, and to upgrade underground utilities and redesign the courtyard with new lights, wider sidewalks and more benches, with red oak trees and serviceberrys lining the walks. Nobody likes to see trees go. Originally, the Ph.D. was for mastery of all fields taught at the University—as conceived by Thomas Jefferson, a true “Renaissance Man.” Was anyone ever awarded it on that basis before 1900? When was the first Ph.D. awarded by the University of Virginia? William Calcott, a Ph.D. in chemical engineering and later director of research at DuPont, may have been intelligent enough and educated widely enough. Some of the old Corks & Curls, such as that edited by James Hay Jr., included a history of the University. Is it possible now for someone to have a comprehensive knowledge of human endeavor? The first Ph.D. was awarded at the University in 1880. According to Philip Alexander Bruce’s History of the University of Virginia 1818-1918, a doctor of philosophy was conferred on students who had “graduated and obtained post graduate distinction” in their studies in any one of the five academic disciplines offered at the University. Degree requirements at UVA were highly contested and reformulated several times during the 19th century. An article in the New York Times on June 12, 1855, suggests that “(UVA’s) standards of graduation are considered higher than those of any other College in the Union.” Corks & Curls from the late 19th century record small numbers of degrees conferred each year, which suggests that the requirements for all degrees were quite rigorous.—Ed. A note from someone tucked away in your Winter 2008 issue (“Secret Society”) struck me as a profound index of the tenor of our times. The writer said, “Sometimes I pretend to talk on my cell phone when I am walking so I feel more popular.” I am convinced that as technology becomes ever more sophisticated, communication—real communication—becomes less, not more. You are beyond the pale if you do not have a cell phone and use it constantly, whether or not you have anything to say. The contrast between this culture and the days when I was a graduate student at the University is immense. In writing (who writes letters anymore?) it is so easy to rattle off whatever comes to mind by e-mail or word processing that the content may be shallow and not carry much of a punch, whereas Shelby Foote, the great Civil War historian, was satisfied with writing a paragraph a day to get it right, writing with a nib-tipped pen. And need we be reminded that Thomas Jefferson in his lifetime wrote some 19,000 letters with a quill pen? My point here is that both men, and others of Jefferson’s era, actually thought about what they were going to say before ever putting pen to paper. But today the means seem to have become more important to the user than the content it produces. I see students at the Irish pub near the University of Pennsylvania with their handheld electronic devices, which seem to become more prestigious the smaller the devices get. At least, they seem to get pleasure in showing off to their friends their latest find. When Karin Wittenborg, the University librarian, was in Philadelphia for a meeting recently, she stopped by to talk with me about my book, Jefferson and the Press (University of South Carolina Press, 2006), which has also been recorded for the blind, and we had a long talk about these matters. She informed me that in three or four years, all surviving printed material worldwide will be available electronically. On the one hand, this would be an incredible help for researchers, but on the other, it means that we would have to start from scratch to sift this material after three or four centuries of selection by scholars, bibliographers, librarians, writers and the public. Has technology pushed us into a position where we may have a Trojan horse on our hands? And we have to worry about cell phones? When you feature upcoming events on Grounds, please be sure to include the UVA men’s tennis matches. The team entered the season ranked No. 5 in the nation and was the No. 1 team most of last year. They made it to the Final Four of the NCAA Tournament for the second year in a row. Coach Brian Boland was named national coach of the year for 2008. 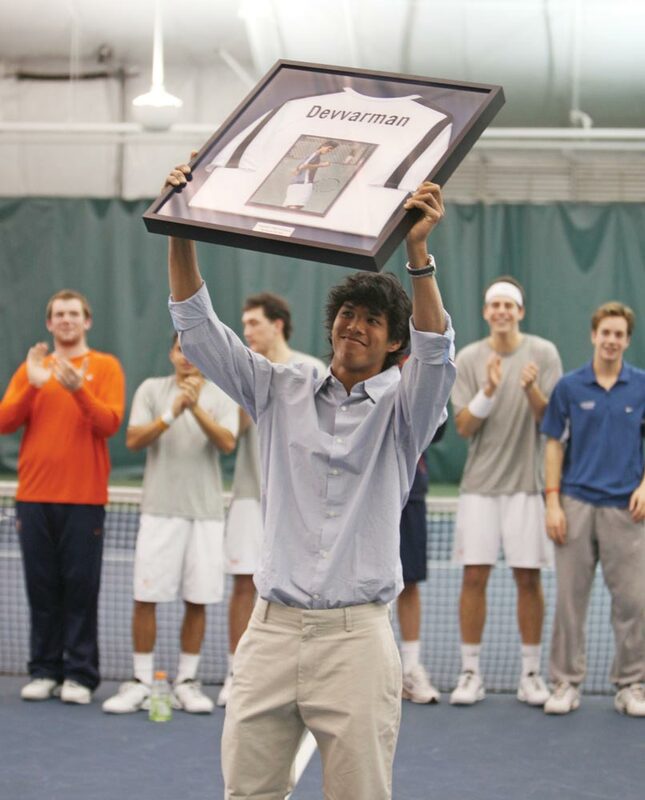 The team is retiring two-time NCAA singles champion Somdev Devvarman’s jersey at the Illinois match at the Boar’s Head Sports Club. Somdev is now ranked No. 155 in the world after starting his professional career at No. 795 last June. He will play Davis Cup for his native India again this year. He is based in Charlottesville and mentions UVA every chance he gets. He usually wears an orange headband when he plays, and UVA gets mentioned all the time by sportscasters who watch his matches. He’s a great UVA alum, as are most former UVA tennis players.